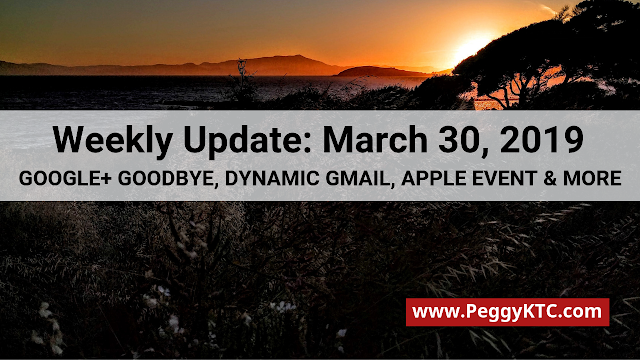 So this is it, the last Weekly Update that I share on Google+. I started the Weekly Update in January 2015 as a way to keep track of updates to YouTube, Google+, Blogger and other Google products and to organize links to my Google+ posts. I am grateful to all of you for reading and sharing! I hope those of you who read this on Google+ will continue reading here, subscribe to the feed or by email, or follow me on Twitter for updates. I hope all you Plussers have downloaded the data you want to save. If not, do it now using Google Takeout or the Friends+Me Google+ Exporter (which lets you export your data in WordPress or Blogger format). Note that the Google+ Exporter was just updated to improve video downloads - if you uploaded a lot of videos to Google+, be sure you have the latest version. If you have a Google+ Page, note you will need to download the Page’s data separately. Your data may be gone completely on April 2nd, so really, truly download it now. And if you want to help add public Google+ content to the Internet Archive, now is the time to do so. If you are looking for another social site, MeWe lets you import your Google Takeout archive of your Google+ data, and if you are verified on Google+, Twitter or other social site, MeWe will add a verified check to your account. And it’s not just Google+ that is shutting down. The goo.gl link shortener will be discontinued March 30th. Those short links will continue to redirect, but you will no longer be able to view or download the data. And Inbox is shutting down April 2nd, so you will have to switch back to using Gmail. Finally, the original announcement in October 2018 that Google+ would be shut down also announced that they would be limiting third party developers ability to request Gmail user data. Developers had to submit applications to be reviewed, and any that were not approved would have their access revoked on March 31, 2019. Because of this change all Gmail triggers and the ability to create a draft email will be removed from IFTTT. Did you notice the updates to Google+? There is now a more user friendly interface for advanced search, and in the absence of the notification bell on desktop, the number of new notifications is now displayed next to “Notifications” on the left menu. There are sure to be more updates for enterprise customers once the shutdown of consumer Google+ is complete. In the Google Photos Android app you can now crop photos of receipts and other documents with a single tap, removing the background and cleaning up the edges. Dynamic AMP emails are rolling out to Gmail users. As an example, instead of receiving multiple individual email notifications when someone mentions you in a Google Docs comment, you will now see an up-to-date thread in Gmail where you can reply without having to open the doc itself. Companies like Pinterest, Doodle and OYO Rooms are already sending emails with interactive elements. And this shouldn’t be a scammer or spammer tool, as businesses have to be approved by Google before they can start sending dynamic messages. Twitch launched Squad Stream, which lets four gaming creators go live and stream together in one window. Currently this feature is only available to Twitch Partners. Users can now add public events to a business or location in the Google Maps Android app. It’s not clear to me how Google is preventing spam or malicious postings, but hopefully there are some protections in place. Google launched new free tools for news publishers and newsrooms: Realtime Content Insights identifies which articles are most popular and local trending topics in real time. The Data Maturity Benchmarking Tool helps publishers “assess their data maturity, compare themselves to other news organizations and take steps to improve.” They are also beta testing tools for promoting subscriptions and improved digital advertising strategies. Apple held a big event where they unveiled Apple TV+ with all original programing from heavy hitters that include Oprah Winfrey, Steven Spielberg, and JJ Abrams. The announcement was scant on practical details, like how much it will cost when it becomes available this fall. They also announced Apple News+ “an immersive magazine and news reading experience”, Apple Arcade, a game subscription service, and the Apple Card credit card, with no fees, low interest rates, a focus on “privacy and security” and a titanium(!) card to use in brick-and-mortar stores. The European Union passed the new Copyright Directive which includes controversial Article 11, requiring search engines and news aggregators to pay publishers to use snippets of content, and Article 13, that makes tech companies responsible for policing the upload of copyrighted content to their platform. It’s not clear what the fallout will be, as individual member states need to approve it and write it into their national law, a process that could take a couple of years. See the links below for discussion. The Google Cloud Next 2019 conference starts on April 9th, and Google has been highlighting some of the scheduled presentations. It doesn’t look like there will be live streams, but highlights from last year were posted on the Cloud Next YouTube channel, so keep an eye out for updates there. Read on for more links, tips and updates for Plussers, YouTubers, webmasters and more. April 9-11: Google Cloud Next ‘19. Check out the highlights before you go.